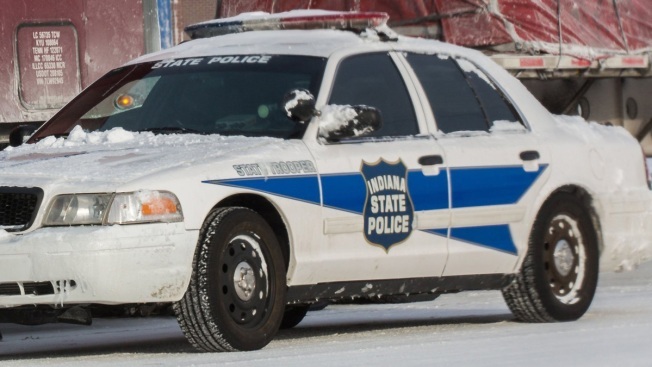 This Jan. 6, 2014, file photo, shows an Indiana State Police car. Authorities say an off-duty Indiana State Police trooper has been shot and wounded by his son at the trooper's home in northern Indiana. The St. Joseph County prosecutor's office says the trooper was shot late Thursday in Granger and was taken to a hospital in semi-stable condition with a single gunshot wound. The prosecutor's office says the trooper's son, who is 11-years-old, was detained on a preliminary charge of attempted murder pending a review by prosecutors and juvenile authorities. The Associated Press isn't reporting the name of the trooper to avoid identifying his son. The shooting is under investigation and the prosecutor's office says it planned to release additional information later.